Note: I started this blog post oh, about 10 days ago, and then life happened. You know, the work project that has been in the works for approximately 10 months but all of the sudden goes into Fast Forward mode, the realization that 4-H record books are due soon, and 627 loads of laundry. So, instead of wasting a good blog post, I’m going to post it anyway. And then I’ll get caught up over the next few days. 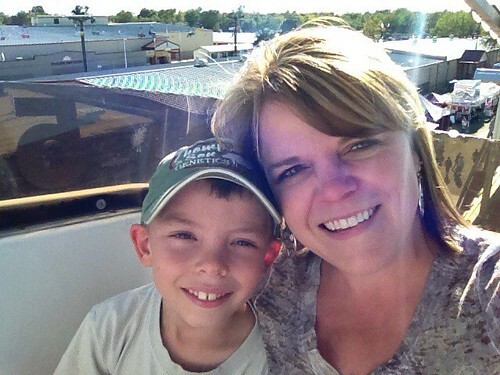 Last weekend the boys (big and little) and I headed to the state fair. It was pig showin’ time again. We had fun, brought home a little hardware and saw friends. Here’s a list of highlights. So one of the dangers of knowing a writer is that your words sometimes end up being a part of a column or a blog post. Sometimes, if you are the kid of a writer, who has friends who are television reporters, your mom signs you up for a television interview that you really don’t want to do. But then your friends say they will be on TV with you, so it really isn’t that scary. That happened. 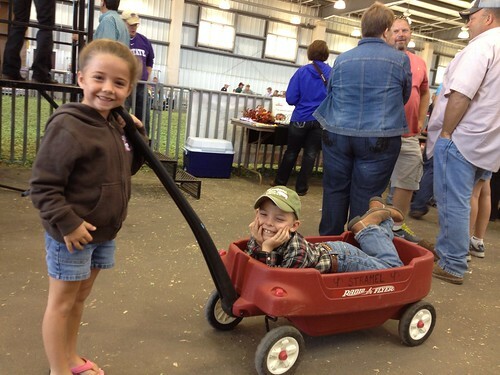 At the fair. I was lucky enough to know it was coming, so I could set my DVR. OK, not really. I knew it was scheduled and had every intention of setting my DVR, but forgot. So my mother-in-law got a frantic phone call to ask beg her to set it for me. This was shortly after the frantic phone call to ask her to bring my son’s shirts. And shortly before the frantic phone call to ask her to bring my boots. Yep. I’m organized like that. Good thing she’s nice and was coming anyway. Back to the point. The interview. My boys were interviewed about their pig projects at the fair and because I’m no technology whiz. I couldn’t figure out how to get a video off my DVR other than to play the recording and video it. I’m such a redneck. The show went well and Campbell made it to the Grand Drive. The Grand Drive is a standing-room only event where all breed champions and reserve champions have are announced in front of the crowd and show off their animals in the ring. 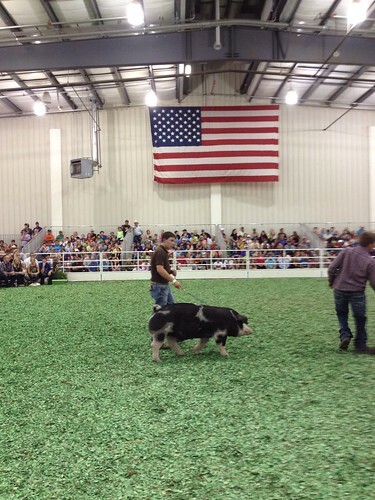 The shows were held earlier in the day, but the Grand and Reserve Grand Champions are not announced until that night. It’s an exciting event, complete with an announcer and cool music. He didn’t win it all, and that’s OK. He met his goal of making it to that night. It’s about fun times with friends and family. Our kids work hard, but they have fun doing it. And they learn that all that work at home leads to being able to meet your goals. 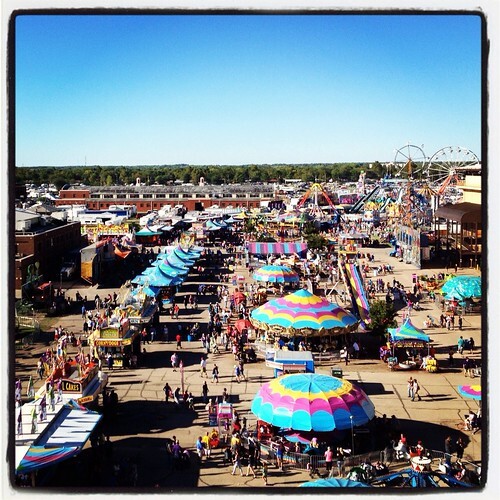 A state fair blog post without comments about fair food is just wrong. I love fair food. Not the price of the food, but the food. So the best thing I ate? A cucumber stuffed with crab salad. Yum. It was fantastic. And the good news? It was not fried and sort of healthy, right? Or maybe it just seemed healthy compared to the chocolate covered bacon or the Krispy Kreme burger. Here’s the point where I should show you a photo, but alas, it was not to be. I was more focused on eating than I was on photography. Sorry about that. You are just going to have to trust me. It was good.